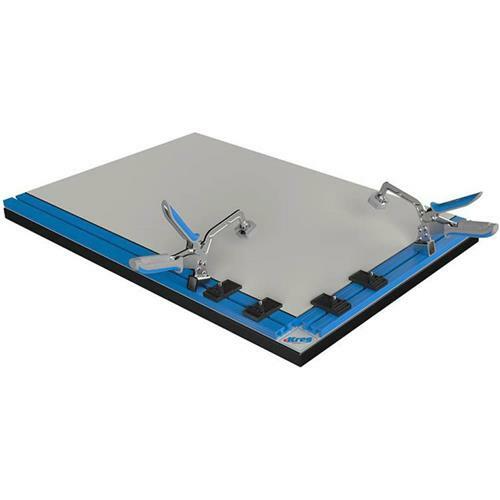 The Kreg Clamp Table is the ultimate clamping solution for Kreg Joinery and works with the entire family of Clamp System Components. If you've ever struggled to get perfectly flush Kreg Joints, failed to get your clamps positioned exactly where you need them, or needed an extra set of hands around the workshop, the Kreg Clamp Table is your perfect solution. Made from glue-resistant melamine, this large 21-3/4" x 33-3/4" replacement work surface is perfect for sanding, sawing, drilling, routing, joining, and almost any other woodworking task. Please note: This is the table top only and does not come with the base. Please see T27929 Table Combo for the top and base combo.